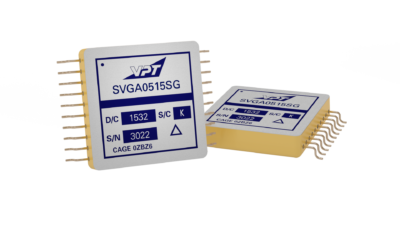 SVGA0515S Point of Load DC-DC Converter | VPT, Inc.
As the world’s first RAD HARD point of load converter, VPT’s SVGA Series is mission proven in systems launching for LEO, MEO, GEO, and deep space missions. Qualified to MIL-PRF-38534 Class K on DLA SMDs, these off-the-shelf units help you get your system off the ground fast. View VPT’s space program heritage. The SVGA Series is an extremely efficient point of load DC-DC converter for stepping down voltage at the point of use. It is ready for rugged duty with characterization to 100krad (Si) total dose radiation under VPT’s certified radiation program per MIL-PRF-38534, Appendix G.
Operating at a nominal frequency of 250 kHz, these regulated non-isolated converters are optimized for low voltage point of load applications with high efficiency synchronous rectification and fast transient response. The SVGA point-of-load converters are designed and manufactured in a facility qualified to ISO9001 and certified to MIL-PRF-38534 Class H and Class K and MIL-STD-883. Combine our extensive family of DC-DC converters for space with these point of load converters for space to create a light weight, extremely efficient, space-ready power system. Guaranteed TID performance to 100krads(Si) including ELDRS, per VPT’s RHA plan specified per MIL-PRF-38534, Appendix G, Level R (100krads). After radiation exposure, converter testing is performed at 25°C per standard datasheet limits. SEE characterized to 85.4 MeV-cm/mg with minor transients only; no dropouts, shutdowns, latch up or burn out. Characterization is performed at both the component level and at the SVGA series hybrid converter level. To provide you with the most accurate data for the actual performance of this product once deployed, please note that the electrical performance data provided below is at Tcase = -55°C to 125°C, Vin= +5V ± 5%, Vout = 3.3V, full load, unless otherwise specified. Subject to all export restrictions and export regulations including but not limited to the Export Administration and Foreign Assets Control Regulations. Further restrictions may apply; contact VPT for details.